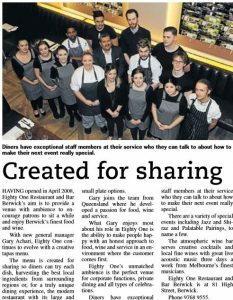 Having opened in April 2008 our aim is to provide a venue with the ambience encouraging patrons to sit awhile and enjoy Berwick's finest food and wine experience. EightyOne is constantly changing and evolving to meet our customer needs and demands. We listen to our customers and in doing so have slightly re designed our menu to meet the high demands for more shared items. With the structure of our menu we encourage you to try different tastes of our various dishes with our smaller plates running all day and larger plates also during lunch and dinner times also to share or be served as a main meal. With the kitchen headed up by Gayan Pieris, we are highly committed to maintaining their philosophy of producing outstanding meals sourcing local ingredients and produce. 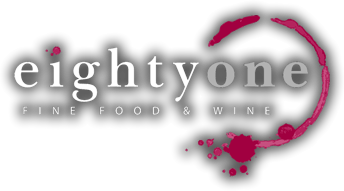 Along with our menu items, Eighty One also support local wine makers such as D’Angelo in Officer, Carlei in Upper Beaconsfield, Cannibal Creek in Tynong North and Bass River in Gippsland. 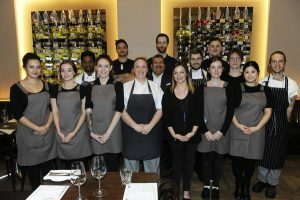 Our dedicated floor team are also at your service should you have any questions..
Our fully licenced venue provides a wonderful array of fine wines, beers and spirits for your enjoyment with either a light meal from our bar or our complete restaurant service. As well as the great shared dining experience we provide an atmospheric Wine Bar with great Live Acoustic Music four days a week, from Melbournes finest musicians. 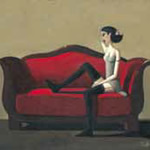 We are thrilled to be able to display the works of Paul Greenwood. Paul is a self taught painter born in 1969 in Bradford, UK. Paul managed to escape an impoverished background through the acceptance of his drawings and paintings. Having finished school at 16 and armed with a portfolio of works, Paul managed to obtain a job as a designer. He progressed through a number of major publishing companies and has in recent times been providing his unique designs for Hallmark cards. 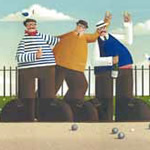 Paul’s individual works have gained great recognition for their imagination, intrigue and in some series amusement. We will be rotating Paul’s work in the venue along with our popular ‘large lesbian ladies’ work. We hope you enjoy.